The log burning stove and its multi-fuel cousin are currently enjoying a revival in the home, and manufacturers have been quick to refresh existing models and launch exciting new ones to attract this new audience. Offering all the ' feel good' that only a real fire can deliver, the new ranges are now easier to manage, more efficient and, for those with modern tastes, far better looking! Positioned within our recently refurbished High Street shop, our stoves are displayed in a dedicated showroom that extends on two levels to over 800 sq ft. Presented in a room setting with working examples, our experienced staff are on hand to talk you through the design and cost options; advise on heat output for each model; and, for those new to real fires, offer a guide to the day-to-day dos and don'ts of owning a traditional stove. Our showroom includes over 20 examples of stoves from some of the world's leading manufacturers, including Villager, Franco Belge, ACR and Nordpeis. Colours are available along with dramatic 'statement' fires around which your interior scheme can unfold. Goddards Stoves also supply a wide range of fireplaces and fireplace surrounds in a selection of styles and materials. Goddards Stoves offer a comprehensive design and installation service, including any associated building work needed to adapt existing chimneys or create new ones. FREE delivery – all stoves purchased from Goddards Stoves qualify for free delivery within our van delivery area. 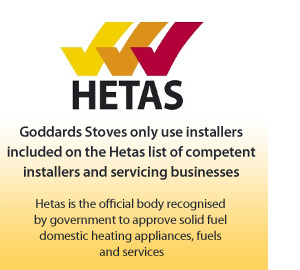 Installation – Goddards Stoves offer a complete installation service for all stoves purchased from the company, using selected manufacturer-trained engineers. The cost of installation varies depending on the size and type of stove ordered and the location of the property. An estimate of costs will be prepared by the engineer, for your consideration, before any work is undertaken. Support and maintenance – our service department can carry out routine services, repairs – in the unlikely event that the equipment fails – and even relocate your stove if you move properties. Please call for an estimate. For those people who like the style of a traditional stove but demand the convenience of an electric fire, Goddards Stoves also sell the complete range of Dimplex electric heaters that include stove-style fires and traditional and contemporary fans and heaters. Goddards Stoves is part of Goddards Electrical.